Early stage of common cold or flu with symptoms of dry cough, painful chest, fever, dry or sore throat, watery or red eyes and headache. Also useful in early presentation of epidemic heat toxins causing tonsillitis, influenza, acute bronchitis, conjunctivitis, chicken pox and measles, especially when accompanied by cough are some of the imbalances satisfied clients have used this product for. 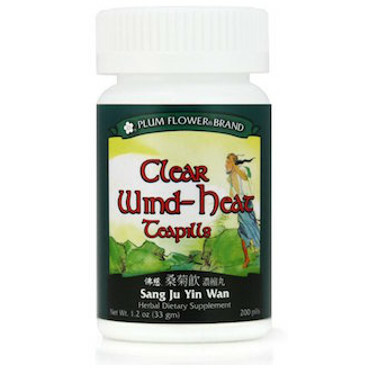 Dispels Pathogenic Wind, Clears Heat, Resolves Toxin, Releases Exterior Wind Heat, Descends and Disperses Lung Qi, Restores the Downward Flow of Lung Qi, Relieves Cough. Phragmites communis rhizome, Morus alba leaf, Chrysanthemum morifolium flower, Forsythia suspensa fruit, Platycodon grandiflorum root, Prunus armeniaca seed, Glycyrrhiza uralensis root, Mentha haplocalyx herb. - Lu gen, Sang ye, Ju hua, Lian qiao, Jie geng, Xing ren, Gan cao, Bo he. Contraindicated for complaints due to wind-cold. Contains tree nuts.